Catching a wild salmon in the 49th state is considered by many the pinnacle of fishing, especially on the Kenai River. This turquoise-colored, fast-moving and icy channel stretching 82 miles from Kenai Lake to Cook Inlet is the granddaddy river of the Kenai Peninsula, and a place where thousands gather each summer to catch kings, reds, silvers, and the occasional pink. It’s also the most popular river fishing destination in Southcentral, with guiding companies dotting the shoreline from Cooper Landing southward along the Sterling Highway. And it was here that my indifference for fishing was markedly changed. 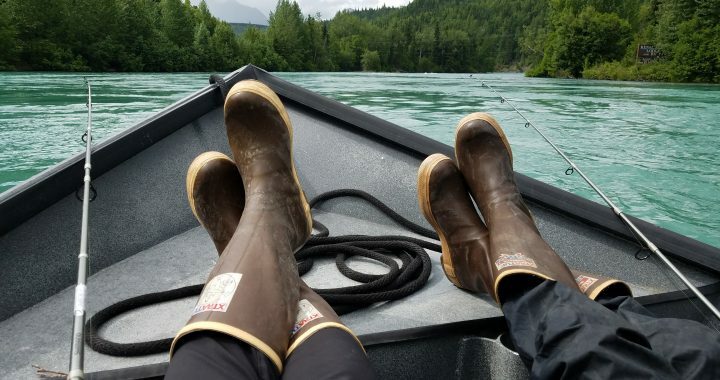 Alaska Rivers Company is one of the longest-operating companies on the Kenai River, with more than 40 years of seeing people and gear safely downstream, hopefully with a few fish in tow as well. Their website says in multiple places that they “welcome kids and families,” so we took them at their word and shuffled on down from Anchorage with my husband, teenage son (and reluctant fisherman), and me on a cloudy Saturday morning. Why had I been so hesitant? I grew up fishing off a lake dock or from a canoe, legs thrown upon gunwale, hat over my eyes, waiting for something to nibble on a worm-wound hook. No, I didn’t try very hard, but that was part of the essence of fishing for me; just being quiet and still, just me, my pole, and a jug of Kool-Aid <—-truth. The sense of “fish urgency” in Alaska does not appeal to me. Pressure is on for visitors who spend hundreds of dollars (and often more) to gear up, pay a guide or charter, and land something they can actually keep (see Alaska Department of Fish and Game Sportfish regulations – you’ll know then what I’m talking about). On the guide’s part, keeping everyone in the boat happy and safe and catching fish is an enormous weight of responsibility. Begging the pardon of my friends (and spouse) who enjoy the sport, it’s just not for me. But Cory and Erik Route, owners of Alaska Rivers Company had done an admirable job of assuring me that this experience would be difference, so I donned XtraTufs and joined my family in the cozy ARC office. Right away, I noticed a difference. Smiling faces, an atmosphere of whimsy, and a “let’s go have some fun” attitude from guide Patrick Brouse. Brouse, a native of Ohio and a lifelong fisherman, is in his second year of guiding for Alaska Rivers Company. He’s also an incoming senior at the University of Alaska Anchorage, majoring in civil engineering. 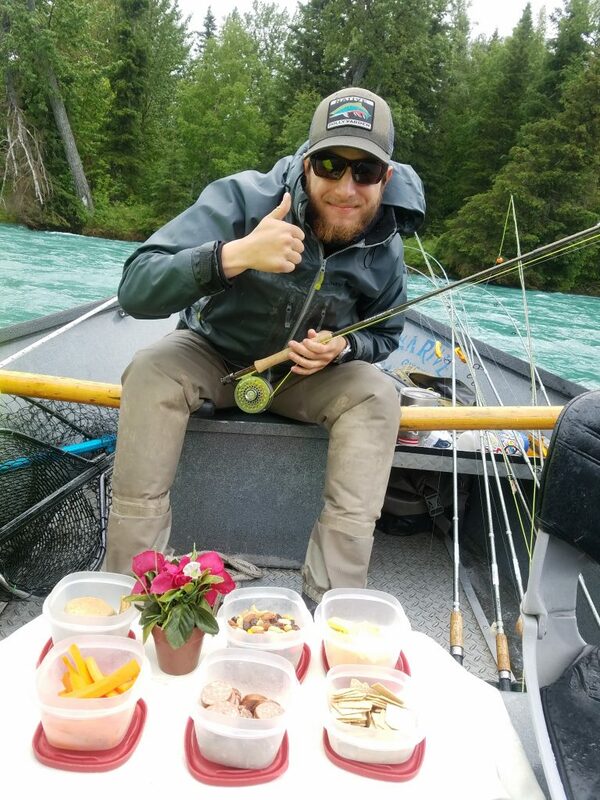 With an intuitive, easygoing nature, Brouse had already done some sleuthing about which kind of fishing this Alaska family might enjoy, and had both fly rods and spinners set to go in the drift boat. We drove a short distance to the Cooper Landing boat launch, put on the PFDs, and scrambled inside the boat. My son was his usual quiet self, taking in a river he’d rafted but not fished before, eyes drifting warily to the unfamiliar fishing rods stashed in the stern. “Ever fly-fished?” Brouse asked him, jockeying the boat around a gaggle of pre-teen girls in five rafts who launched at the same time we did. My 13-year-old shook his head. “I don’t really fish too much,” he said, shrugging his shoulders. We settled in while Brouse configured a little “popcorn” fly to our lines and called us each up, one by one, for a lesson in boat-bound river fly fishing. We tossed, tangled, and tossed again, but all eventually got the rhythmic “flick” of the bright green line into the water. Note: This was far more fun than I had imagined, and found it to be not dull at all with the out and back action of the rod. Our four-hour trip went mostly like this: Fly fish, learn quickly that fish nab and run so a quick, light jerk on the line sets the hook; lose the fish, repeat. We fished with spinners too: Drop the line, wait, pull up the line, cast out (not so hard, either), get a hit, quick release <—– Brouse told me to say that – fishing’s been slow so far in 2018, which happens sometimes. About halfway through, Brouse fixed a spread of Indian Valley sausage, cheese, carrot sticks, and exceptional cookies made on site at Alaska Rivers Company base camp. He even put a little flower on our cooler-table, which was a lovely touch. We saw eagles, a little black bear that stood up to catch a better view of these strange creatures floating by, and a Merganzer resting on a rock. It was sunny, it poured rain, and became warm again. Off, on, and off again. Sort of like fishing itself. Find the company at Mile 50 of the Sterling Highway. 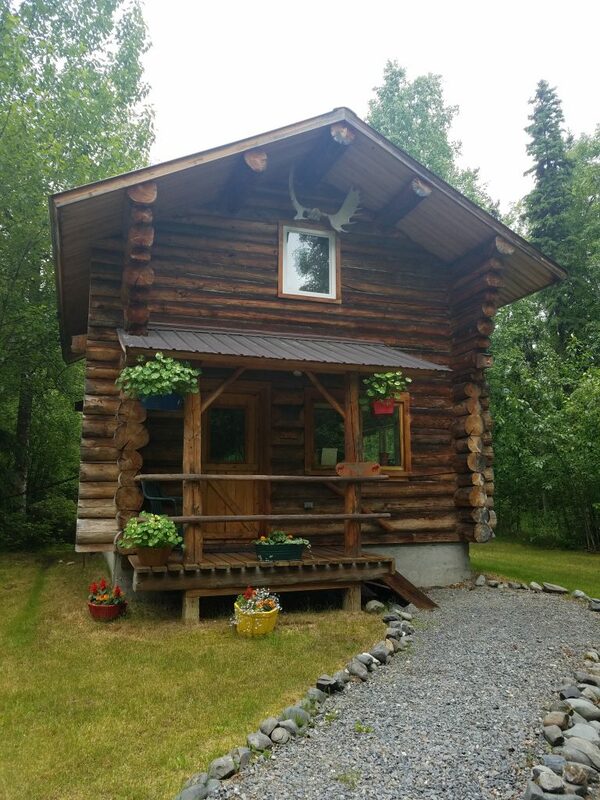 It’s charming and you must explore the property with its 180 nesting boxes for swallows (great but-eaters, those little guys); flowers; and beautiful log cabins that are available for rent. A half-day trip is only $150 per person and includes gear, snacks, boots, rain pants/jackets, and a helpful, knowledgable guide who truly does want to know about your group. We liked that. Afternoon trips leave at 2 p.m. and I highly recommend for those with older kids. We traveled from Anchorage and it was far easier to get up, eat a solid breakfast, and ease our way down to Cooper Landing. Our expert opinion is to take kids age seven and up, but some younger kids may serious fishermen or women, so I of course defer to parents. Do NOT forget your Alaska fishing license. Buy one online HERE. Any non-resident age 16 or older, OR a resident age 18 or older needs a valid license. You cannot buy a license on site. Lower your expectations, have fun, and take in the incredible beauty of the Kenai River. 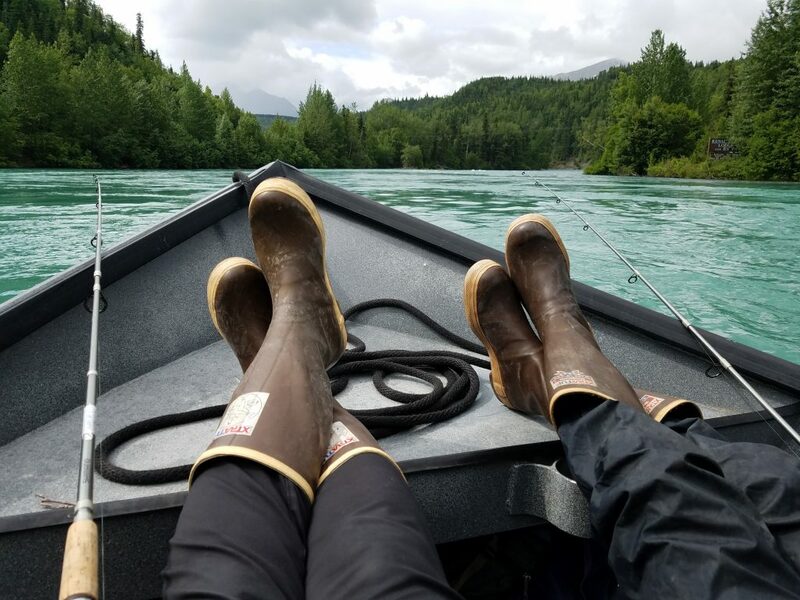 Even if you’ve driven the highway or fished from the banks, there is nothing like floating the Kenai. Nothing. Fish on, I will. 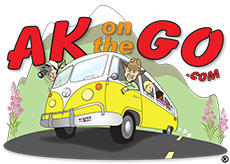 Posted in Fishing Alaska, Kenai Peninsula and tagged Alaska, Alaska Rivers Company, Alaska with Kids, Cooper Landing, Family Travel, fishing, fishing with kids, fly fishing Alaska, Kenai River, river guides, salmon fishing Alaska. Erin, so glad your family was able to get out and enjoy the Upper Kenai! Drift fishing this non motorized portion of the river makes for such a different experience many Alaskans have yet to enjoy!